Seventy-seven miles per hour, for 55.8 seconds, dropping 4000 vertical feet. Bobsledding the Utah Olympic Bobsled Course was an exhilarating end to our honeymoon. We could not be happier, having spent the week enjoying the snow in beautiful Park City, Utah. We had decided early on that a summer wedding was not for us. With school and work schedules to consider, we chose to have our wedding just after Christmas, near the bride's home in Princeton, New Jersey. The reception had a beautiful winter theme, with white hydrangeas and dendrobiums surrounding large centerpieces filled with birch branches. 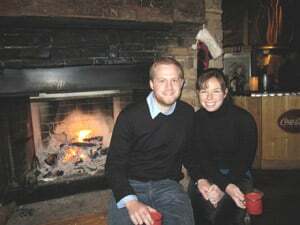 Our honeymoon became an extension of our wedding theme, warm and cozy amongst the snow-covered mountains. With only a week for our trip, we decided a domestic trip would be beautiful and exciting, yet easily accessible. We left in the afternoon the day after the wedding, giving us the chance to have brunch with our guests. Our flight from Newark to Salt Lake City was easy and direct, followed by a half-hour limo ride from the airport to our Park City hotel. The moonlit drive up the mountains was beautiful, with the lights from the houses reflecting off the pristine powder. We were eager to explore, but exhausted and excited for our hotel. Our accommodations were at the Silver King Hotel on the Park City Mountain Resort. We had a studio unit with a fireplace and jetted tub, as well as a skylight overlooking the mountains. The room was a great size and even included a full kitchen. Our bed was next to the crackling fire, and the jetted tub was great for sore muscles after skiing. We especially enjoyed swimming in the cool winter air through the indoor/outdoor pool. 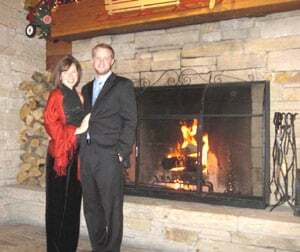 The Siler King was the perfect place for a cozy winter honeymoon. We spent the first full day of our trip exploring Park City. 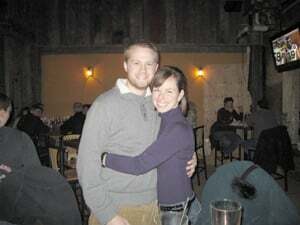 The town has much to offer by way of shopping and restaurants, most of which are centered around Main Street. Everything is easily accessible via the free bus system that picked us up in front of our hotel. We explored the numerous natural jewelry and furniture stores, and ate pizza that could rival New York City's. It was a great way to start our trip and get used to our surroundings. That evening, we rode a horse-drawn slay up the ski mountain. They dropped us off at a Western-themed lodge on the side of the mountain, where they served dinner and played country music. The fish had been caught that day and was fantastic! Our first skiing adventure came on our second day. We walked from our hotel to the rental store, and were on the mountain skiing by nine in the morning. Alison took a lesson to improve her skills, while Bracken (who used to ski race in Maine) headed to the top of the mountain. The skiing was everything you would expect in Utah, with clear blue skies and plenty of snow. We spent the whole day skiing, from relaxing on the beginner trails to hitting the moguls on the expert trails. After a tough day of skiing, we headed to the spa for the honeymoon treatment, complete with massage, manicure and pedicure. The spa owner even picked us up and dropped us off, bringing us to get Mexican food on the way home. It was the typical experience with Park City locals, accommodating and generous for every moment of our trip. Wednesday was New Years Eve, and we spent most of our day cross-country skiing. Park City has a beautiful network of cross-country ski trails, with rentals and lessons for those that need them. We have always been an active couple, and cross-country skiing was a great way to remain active on our honeymoon. With the help of our Traveler's Joy registry, we had received enough gifts to celebrate New Years at the Giltretrind Restaurant at the Stein Erikson Lodge. Nestled on the side of Deer Valley Mountain Resort, we watched the snow-cats groom the mountain while enjoying our five-course meal, including steak and Maine lobster. The Tuxedo Snowball (mango mousse inside a meringue ball covered in coconut) was probably the best dessert we've ever had. After dinner, we opted for an early night watching the ball drop on East Coast while lying by the fire. We spent Thursday relaxing again, enjoying the beautiful weather and our time together. We explored Park City more, and then swam in the pool. Looking for local cuisine, we stumbled upon the No Name Saloon, whose specialty is the buffalo burger. Their menu noted, "Buffalo shy? We will reluctantly substitute a ground chuck beef burger for any of the above (you sissy!)." Needless to say, the buffalo burger was fantastic. On Friday, we went to the Utah Olympic Park. They offer zipline rides and sledding, as well as tours of the facility. We saw the summer ski jump practice pool, as well as the Nordic ski jumps. Though it was expensive, we opted for the bobsled ride, as we knew it was a once in a lifetime opportunity. After a quick tutorial, they loaded us into a real Olympic bobsled behind a professional driver. Next thing we knew, we were flying at 77 MPH down the course, feeling upwards of four times the force of gravity around each corner. It was the most exhilarating experience ever, and we had the bumps and bruises to prove it. That night, Park City received about nine inches of fresh powder, and we spent our final day skiing Park City Mountain. The extra snow made for an unbelievable day of skiing. Utah snow is especially light, and definitely worth the trip for anyone who loves ideal skiing conditions. When the week was over, we were definitely not ready to leave. Park City was a beautiful location for our honeymoon, and offered activities for whatever we wanted that moment, from skiing, to cross-country skiing, to ice-skating and even alpine slides. The food was excellent, and our bobsled ride was thrilling. 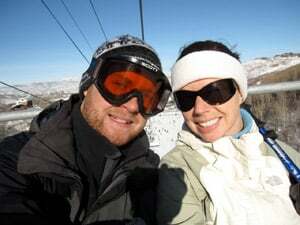 We would definitely recommend Park City to anyone looking for an active and engaging honeymoon that still offers the comfort and coziness for newlyweds. Airfare was reasonable from Newark, with a non-stop round-trip flight costing us about $450 each. Limo service from the airport to the hotel was $100 each way. The studio unit at the Silver King Hotel was $300 a night, as we had booked early in the summer. Ski tickets are about $90 each, and ski rentals are only about $20 per day. Meals are very reasonable and range from take-out to gourmet dinners. The bobsled ride was $200 per person. As with any ski vacation, holiday rates are more expensive for almost everything. Park City also hosts the Sundance Film Festival in January, and rates are higher for that week as well. Overall, costs were reasonable for a ski vacation, and can range significantly based on your budget.